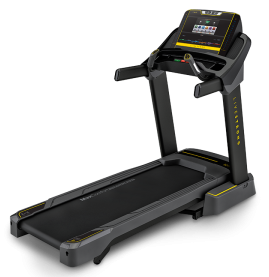 The Livestrong LS15.0T treadmill is a new folding model built for heavy-duty training and an extra long belt to accommodate people with longer strides. 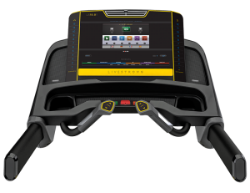 The Livestrong LS15.0T treadmill has a generous 10" HD touchscreen LCD console displaying time, speed, incline, distance traveled, calories burned and heart rate. The Livetrack™ fitness journal tracks your progress and the 11 programs provide a variety of workouts, including manual, rolling hills, fat burn, target heart rate, fitness tests (Army, Navy, Air Force, Marines, PED, Gerkin) and 5K run. 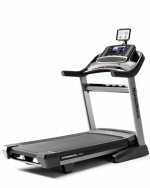 The Livestrong LS15.0T treadmill is quickly getting positive buzz for its solid design and Livestrong’s continuing success at providing excellent machines at a reasonable price. Although listed at a retail price of $2400, you can usually find it for $1400. Reviews consistently praise the Livetrack system, which charts your progress in the console's fitness journal. You get a workout recap each time and you can view your progress over time using the simple, push-button controls. Reviewers also like the accuracy of the wireless, Polar® heart rate monitor. Serious athletes training for marathons note that the stability of this machine is impressive for a folding unit. The workouts on the Livestrong LS15.0T range from easy to grueling. If you want to challenge yourself the way you'd be challenged in the military, you'll love the fitness tests provided that are based on those in most branches of the military, giving you unofficial bragging rights when you’ve conquered them. The LCD display screen is a full 10" inches and has rapid-fire adjustment of all features for a seamless workout. We were particularly impressed with how quiet the motor was; you'll be able to use this while watching television, then fold it up when you're finished. The warranty is a strong one and a portion of sales of every treadmill goes to the Lance Armstrong Foundation to fight cancer. It's a bit overpriced at the MSRP of $2400, but the sale price of $1400 makes the Livestrong LS15.0T treadmill a bargain.